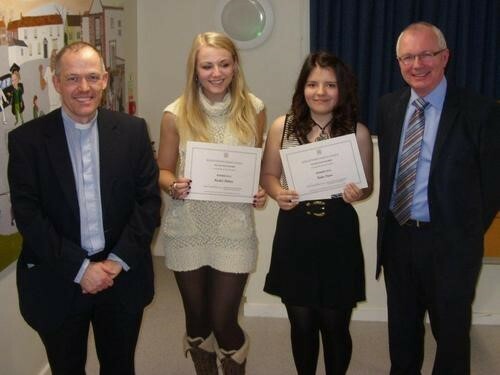 Introduced by the Bishopthorpe Millennium Trust following the successful Pageant of 2000, and now under the auspices of the Parish Council, the Youth Award has been presented since 2002. It aims to recognise the work that our young people do with both young and elderly people, working within the church, schools, sports clubs or organisations both within the village and the wider world. Katie has worked as a Young Leader with Bishopthorpe Rainbows and Brownies arranging stimulating crafts and games to reinforce the Girl Guiding ethos of thinking of others before themselves. She has been recognised as an outstanding role model to the girls and also represents the local group at district planning meetings of the Girl Guiding organisation. She has also gained her Silver Duke of Edinburgh award. Rachel was nominated for her work in raising funds by singing for several charities including Cancer UK, Alzheimer’s Society, The Martin House Hospice and S.N.A.P.P.Y (Special Needs Activities and Play Provision for York) – a charity, very close to her heart where she has met and helped some of the children who benefit from this organisation. Rachel also helps out at the St Andrews Church Holiday Club, the Quench Cafe and helped to organise the children’s street party to celebrate the Queen’s Diamond Jubilee. She is also known to many for her parts in the Ebor Players Pantomime – this year playing a very successful Princess Crystal in Jack and the Beanstalk. Congratulations to both these very worthy winners.